Multi-location hybrid events have been around for a few years, but haven’t yet achieved a mass uptake. Some recent high profile examples suggest this is changing, that the benefits are becoming clearer to corporate communication teams. One reason for the slow uptake of hybrid events has been confusion about what they actually are. 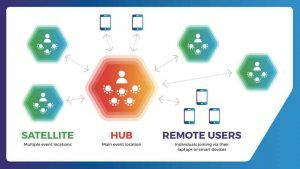 What’s a multi-location hybrid event? 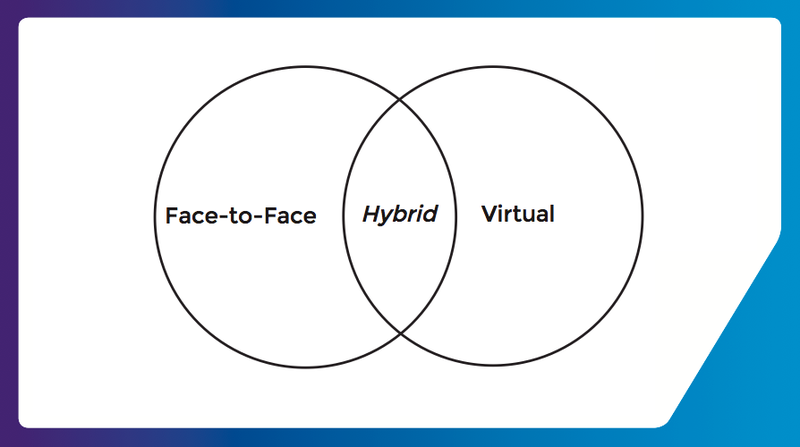 In short, hybrid events are a combination of a face-to-face and a virtual event. Audiences in different cities or countries connected into a single experience. The key point is that, unlike virtual events, people are face-to-face as part of an audience and as such they experience the power of human congregation. Where TED and Google go others follow and both organisations have embraced the hybrid model. This year there are three ways you can experience TED’s flagship event: buy a very expensive and hard to come by ticket and make your way to Vancouver; watch the talks for free online (and probably on your own); or join with other like-minded folk and watch parts of it live at your local cinema. For fans of TED such is the attraction of having a more communal experience that twenty London cinemas have scheduled content as part of TED Cinema. Held in San Francisco Google I/O is the tech giant’s annual developer conference. Thousands attend in person, over 2million join the live stream, others come together as satellite audiences at over 450 venues around the world. Given that I/O stands for innovation in the open, and is all about collaboration you can see the attraction of having a communal experience. There’s a great bit of video (scroll to 4.10min) showing the satellite audiences being introduced to the main event audience. The above scenarios are obviously very different to an internal communications landscape. So it’s worth considering what the particular benefits might be of exploring a hybrid model for your organisation. Most obviously, if you have a complex distribution of employees a hybrid model helps you bring them together into a single experience. If your leadership team doesn’t have the time to take part in a roadshow this model reduces their time commitment. If you want to run shorter sharper sessions hybrid events are particularly attractive. Traditionally the duration of an event is in part dictated by the participants’ travel times, often meaning events extend beyond what is necessary. Hybrid models allow you to be more fleet of foot. The first questions people tend to ask about hybrid events are about the technology, but this is straightforward and well established. The questions people should be asking are how you achieve the degree of participation and involvement that the best employee events need to have. Combining great facilitation across the different event locations with locally run presentations and existing or easily configured digital channels mean that you can achieve fantastic levels of highly active engagement. Having a number of smaller audiences rather than one large group actually helps the level of participation and delivers more brain-friendly personal experiences. Hybrid events don’t solve your every problem. They still take lots of work to organise, they don’t necessarily cost less and they still require a lot of the people hosting and presenting. But if you want the power of face-to-face whilst overcoming the constraints of distance then you should test this model.